According to Wikipedia, the Irish first began making soda breads in 1840 when bicarbonate of soda was introduced to Ireland. 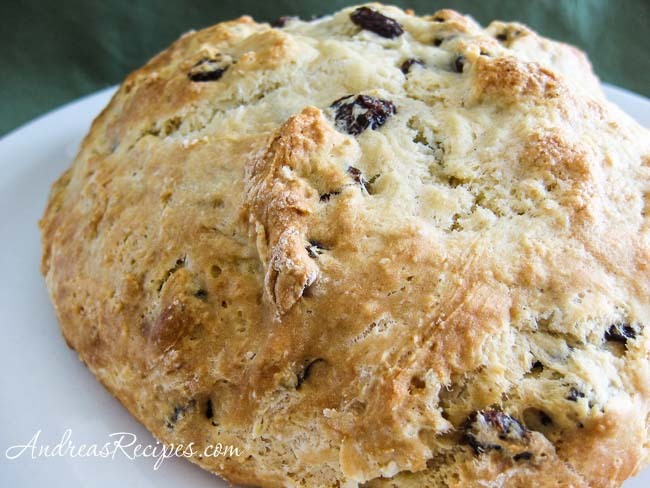 This is the Meyers’ family Irish Soda Bread recipe, but the recipe is not entirely traditional since it includes baking powder. My mother-in-law makes this every year for St. Patrick’s Day, and we have continued the family tradition. I love pieces of it toasted and slathered with fresh butter for breakfast. Because the dough requires only minimal mixing and shaping, I do this all by hand. You can use a stand mixer and dough hook, just take care not to overwork the dough or the bread will be tough. Combine flour, salt, baking powder, soda, and sugar. Add butter and cut in until crumbly. Stir in the currants. Turn the dough out onto a wooden board sprinkled with flour. Knead the dough for a minute, no longer. If the dough is a little sticky, dust with some extra flour. Take care not to overwork the dough or add too much extra flour, or the bread will be tough. Divide dough in half and shape each into a round loaf. Place each loaf into an 8-inch round cake pan. Cut a cross on top of each loaf, about 1/2-inch deep. Then brush each with milk and sprinkle sugar on the top. You can use whole wheat flour, too. I often use half whole wheat/half white unbleached flour. This bread freezes well. Double wrap in plastic wrap and place in a freezer bag. If you don’t keep buttermilk on hand, you can make it yourself. Mix 3 tablespoons white vinegar and add milk until you have required amount for recipe. Allow to sit on the counter for 15 to 20 minutes to give it time to curdle. That’s wonderful! So glad you like it. When cutting the X into the top of the loosely shaped boule (ball, rounded form), I find it helpful to first wet a very sharp, thin-bladed slicing knive (not a thick European chef’s knife). Clean the knife, re-wet it for the second loaf. I then, as your recipe directs, use a pastry brush to coat the top with milk. Today I am making more loaves to take to a friend’s cheese tasting party. She loves this (your) Irish Soda Bread recipe (so do I). She even wanted me to make it for her wedding buffet 😉 — no kidding. But, guess what, I made two loaves (recipe) and it was completely gone by the time she got a chance to enjoy the buffet. I misplaced my many print outs, so came by your web site just now to print out another copy. I have to rush off to make some (so easy), but just had to let you and readers know how much I and friends love it. Although it is a bit similar to the Joy of Cooking recipe, it is much better. I’m not sure of the technical details, but I much prefer your family recipe for texture and flavor. So a big, THANK YOU! Those were smiling faces, not quizzical or frowns. I also meant to say, “wetted” potting mix (not wetting). I’m baking today’s loaves for the same friend whose wedding I baked it for. I know she loves it, so usually try to bring her a loaf or two when we visit. Hi Brianna. Yes, I have made the soda bread with half whole wheat/half white unbleached flour, and the texture was still about the same.